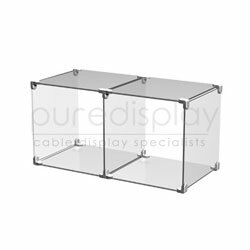 These acrylic cubes are ideal for window and in-store product displays. Chrome connectors are used with 3/16" thick acrylic panels to create these cube displays. This set consists of a group of two cubes. To assemble the cube display, a nylon screw within the chrome connectors are used to attach the acrylic panels together.